Delightfully simple way to enjoy more fish in your diet. 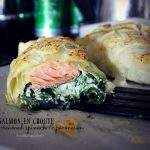 This easy salmon recipe sees lovely fillets wrapped in golden puff pastry with a ooey-gooey filling of marscapone and parmesan cheese and spinach. The fish is gently steamed within the pastry to give it that succulent tender flakes and the creamy filling keeps everything moist.